Today we would like to showcase MYPIC, a custom illustration arrangement service geared especially toward manga lovers. MYPIC artists turn any photo into an illustration. 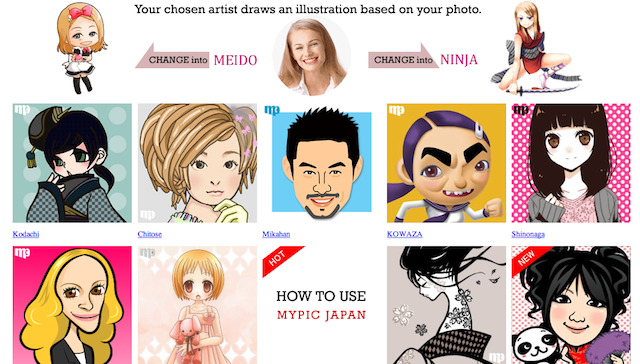 Once you access the MYPIC website, you can browse hundreds of outstanding illustration samples (mostly manga-style) drawn by Japanese artists. There are custom-made portraits and avatars, all of which are based on clients actual photos. As of Nov. 2013, about 200 artists belong to MYPIC. And so far, over 20,000 illustrations have been created through their service. A personalized MYPIC image would be perfect for the profile avatar on your blog or social networking site, business card, and even as a gift to your friends/families! How to order is quite simple. 6) An illustration created just for you will be completed in 3-4 weeks.